Pair of Chicago Steel players, Tri-City Storm defenseman earn weekly honors. 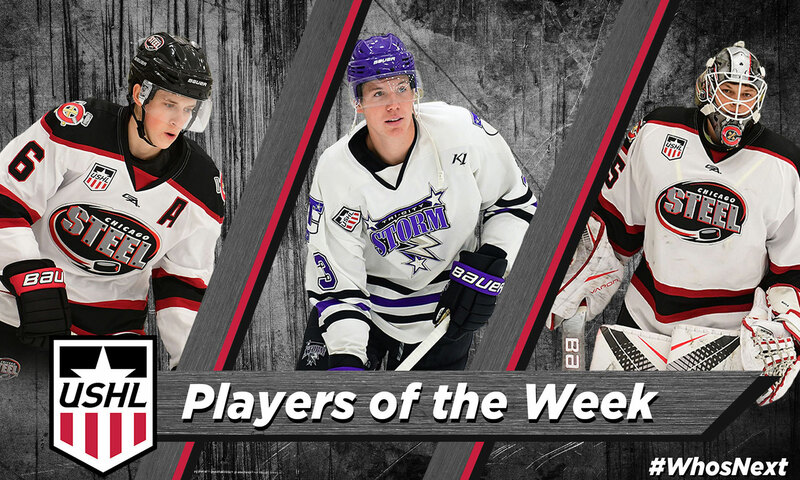 The United States Hockey League announced the Forward, Defenseman and Goaltender of the Week for Week 10 of the 2018-19 season. 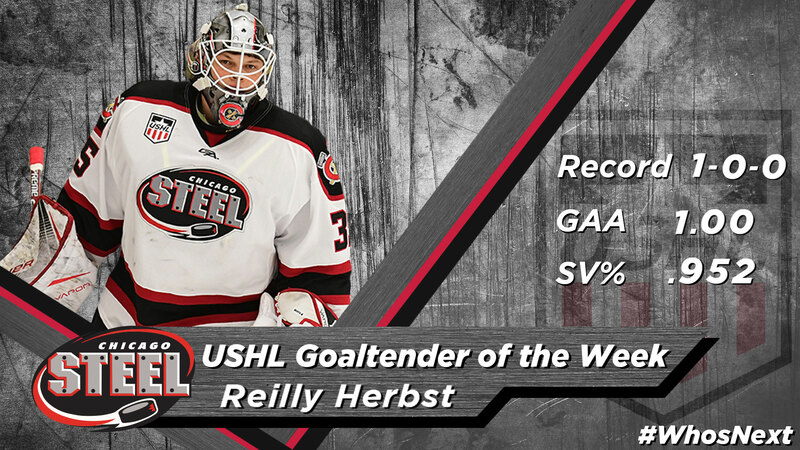 For the third straight week, a pair of teammates earned weekly honors - Chicago Steel forward Nick Abruzzese and goaltender Reilly Herbst - while Tri-City Storm defenseman Ronnie Attard was named Defenseman of the Week for the first time. Abruzzese scored twice and added three assists over the weekend to help Chicago extend their winning streak to seven games, Attard scored three goals and dished out a helper to help Tri-City earn their fifth and sixth consecutive victories and Herbst stopped 20 of the 21 shots he faced on Saturday to help the Steel to a road win at Central Illinois. The USHL is America’s only Tier 1 junior hockey league, and continues to lead the world in the advancement of Division I college hockey athletes. 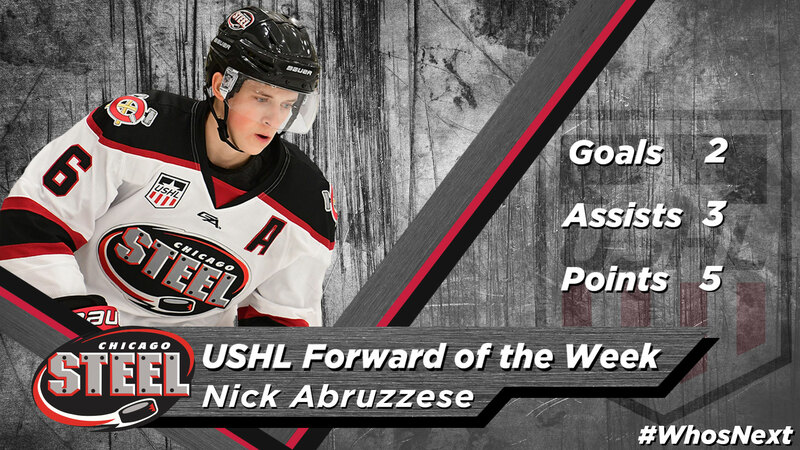 Abruzzese recorded five points in two games over the weekend to help Chicago extend their winning streak to seven games, the longest active winning streak in the USHL. He scored a goal and added an assist on Friday before scoring again and dishing out two helpers on Saturday to complete the Steel's home-and-home weekend sweep of the Central Illinois Flying Aces. The Harvard University commit extended his point streak to five games over the weekend with his performance and has put up nine points (3G, 6A) in those contests. He has earned at least one point in 13 of the 19 games in which he's played and leads the Steel in scoring with 21 points (5G, 16A) in those 19 games. He also leads the team and is tied for seventh among all USHL players with his 16 assists. Abruzzese is in his second season with Chicago and is coming off a 2017-18 campaign in which he recorded 36 points (13G, 23A) in 56 regular season games along with four points (1G, 3A) in seven Clark Cup Playoffs contests. A native of Slate Hill, NY, Abruzzese was acquired by the Steel from the Lincoln Stars on May 3, 2017. He was originally drafted by Lincoln in the 15th round, 241st overall in the 2016 USHL Phase II Draft and previously played for the North Jersey Avalanche (T1EHL) and New Jersey Junior Titans (NAHL). Attard scored a goal and recorded his seventh assist of the season in Tri-City's 7-3 victory over Sioux Falls on Friday before adding two goals, including the game-winner, as the Storm extended their winning streak to six games with a 3-2 win over the Cedar Rapids RoughRiders on Saturday afternoon. The White Lake, MI native has earned points in three straight and six of his last eight games dating back to Nov. 10, with four multi-point performances in those contests. Attard is now tied for second on the Storm and tied for seventh among all USHL defensemen in scoring with 13 points (6G, 7A) in 14 games, with his six goals placing him in a tie for second on the team and among all USHL blueliners. He is also tied for fifth in the USHL with his +14 rating. 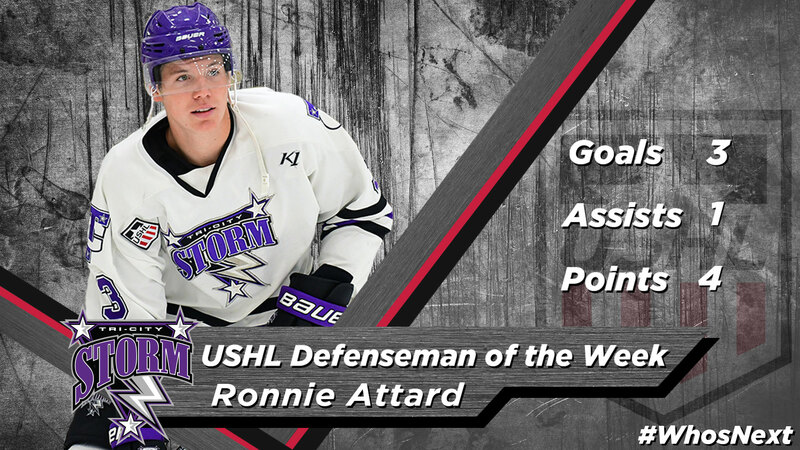 2018-19 marks Attard's third season in the USHL. He has played in 110 career games, all with the Storm, amassing 33 points (17G, 16A) in those contests. Attard, a Western Michigan University commit, was selected by Tri-City in the 10th round, 158th overall in the 2018 USHL Phase I Draft and was named to the U.S. Junior Select Team that will compete in next week's World Junior A Challenge. Prior to his time in the USHL, Attard skated for Victory Honda (T1EHL). In his only start of the weekend, Herbst stopped 20 of the 21 shots he faced to lead Chicago to a 5-1 win over Central Illinois, completing the Steel's home-and-home weekend sweep of the Flying Aces and extending his team's win streak to seven games, the longest active winning streak in the USHL. The Niwot, CO native was outstanding in his first appearance since Nov. 17, recording back-to-back victories and moving his record back to the .500 mark at 2-2-0-0. In his five appearances this season, Herbst has faced 92 shots in 234 minutes of work. He also backstopped the Steel to their third victory of their current seven-game winning streak as he made 16 saves on 19 shots to help Chicago earn a 5-3 victory over Team USA's U17 team on Nov. 17. Herbst was drafted by Chicago in the sixth round, 90th overall in the 2018 USHL Phase II Draft and previously played for the Colorado Thunderbirds (T1EHL) and Selects Hockey Academy (USPHL).